Griswold History Society (GHS) arranged a lecture by Professor Pervez Hoodbhoy (Professor Nuclear Physics, Quaid-e-Azam University and Lahore University of Management Sciences) entitled ‘Pakistan as a Nuclear State’ on 25 January 2012. Speaking to a packed hall of over three hundred people including members of the administration, faculty and students, Professor Hoodbhoy narrated the history of the nuclear age in South Asia. Arguing that Pakistan’s nuclear weapons were only developed to counter India, Professor Hoodbhoy asserted that neither have these weapons protected us against India nor have they given us internal security. Professor Hoodbhoy related the high military expenditure, where a lot of money goes into developing, maintaining and protecting nuclear facilities, as one of the main causes of retarded development in the country. 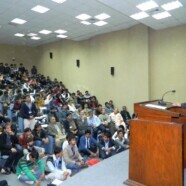 Professor Hoodbhoy called nuclear weapons ‘A Road to Nowhere’ and called for worldwide nuclear disarmament. The lecture was followed by a spirited forty minute questions and answer session.